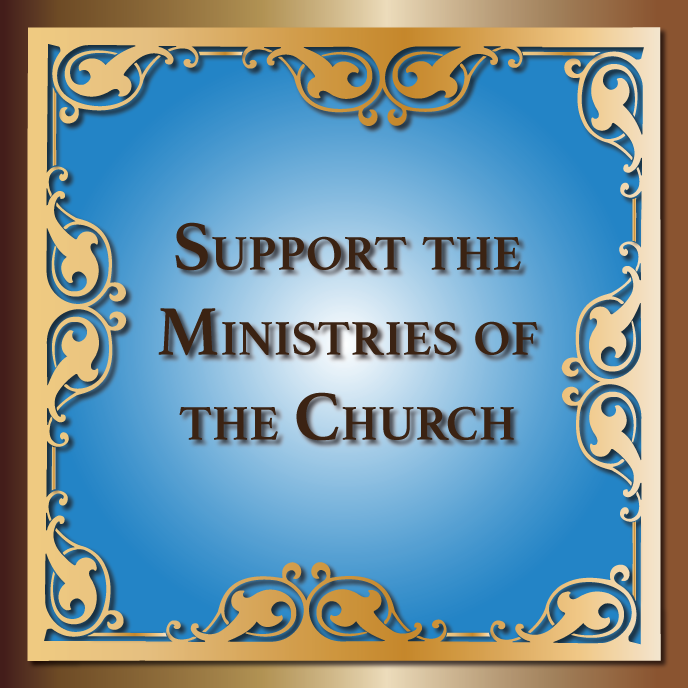 Ukrainian Orthodox Church of the USA - Visit With a Lot of Warm and Memorable Moments! Visit With a Lot of Warm and Memorable Moments! On the weekend of December 17th, the Ukrainian Orthodox Parish of St. Vladimir in Los Angeles, CA received a visit from His Grace Bishop Daniel, the Ruling Hierarch of the Western Eparchy of the Ukrainian Orthodox Church of the USA. Friday’s itinerary included a visit to Loyola Marymount University in Los Angeles. Fr. Deacon Nicholas E. Denysenko. PhD, Professor of Theology at the University extended the invitation to the bishop to be introduced to the faculty and the Huffington Ecumenical Institute members. On Saturday afternoon, His Grace Bishop Daniel had a formal meeting with the Ukrainian Orthodox clergy of the Los Angeles area, V. Rev. Vasile Sauciur of Saint Vladimir Ukrainian Orthodox Pro-Cathedral, V. Rev. Vasyl Shtelen and Fr. Deacon Oleh Sasiuk of Saint Andrew Ukrainian Orthodox parish. His Grace Bishop Daniel shared his vision of the pastoral ministry in the 21st century. During the meeting, a number of creative ideas were discussed, along with ways to offer effective ministry to our communities. Vespers was celebrated at St. Vladimir parish, as His Grace presided and Fr. Vasile and Fr. Deacon Oleh served. After the Vespers, His Grace delivered a short sermon reflecting about challenges that our society faces as we strive for Christians perfection. On Sunday, the Saint Nicholas Feast was held at the Saint Vladimir Ukrainian Orthodox Pro Cathedral. It was a great event enjoyed by all. Even though the weather was unusually rainy for Southern California, the parishioners decided to leave the comfort of their homes and were happy to meet and greet their Archpastor, His Grace Bishop Daniel. The children also greeted the Bishop with flowers and smiles. 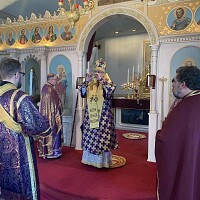 At the Divine Liturgy, His Grace Bishop Daniel concelebrated with V Rev. Fr. Vasile Sauciur, Fr. Jonathan Netaniu, from Republic of Moldova, and Deacon Oleh Saciuk. 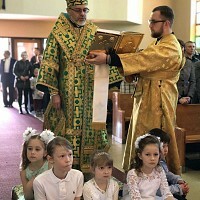 Assisting at the altar were Subdeacons Gary Gebet, Vasyl Pasakas, Juan David De Jesus, altar servers William Krivsky, Mykola Sauciur and John Astalis. The choir participated with their harmonious responses under the talented directing hand of Debora Kaspersky, and chanting by reader Alex Wlasenko. Everyone from the church was amazed by His Grace and his inspiring homily on becoming more active in the Orthodox Christian faith. He especially had a strong connection with the children, even the youngest generation of our parish. After the Liturgy everyone was invited to the parish hall for a tasty dinner prepared by our talented cooks. A concert followed, given by the children from Saint Vladimir parish Ukrainian school. Each child received a nice present from Saint Nicholas, sent through the hands of the Bishop Daniel. Afterwards, parishioners gladly spoke with His Grace about various topics. All in all, Bishop Daniel's visit was short but very meaningful. It left a lot of warm and memorable moments in everyone’s heart. Mission Team Leaves with Hope and Love to Visit the Children of Ukrainian Orphanage! Winter Mission Team Returns Home!